We are in the depths of (the Polar Vortex) winter and I don’t know about you but I need all the distraction I can get to stop dreading the cold. 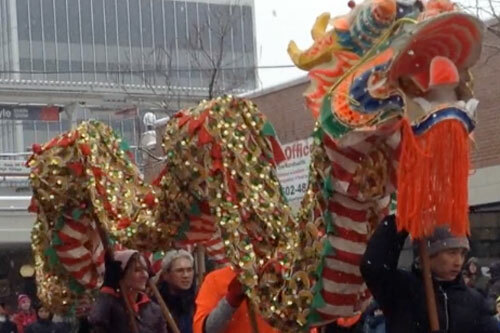 Over the last few years one distraction that I really look forward to is the Chinese New Year parade. 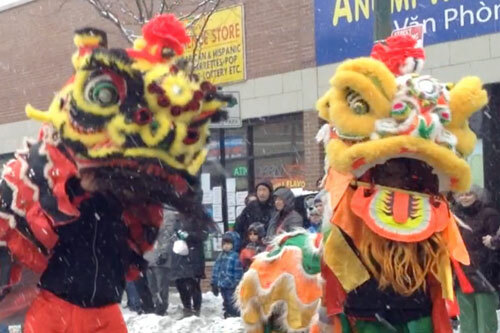 The bright colors, fireworks, lions and dragons do a lot to warm the soul. I love that it’s in February and forces us to get outside and have some fun, usually followed by lunch at our favorite Chinese restaurant. Last year there was also a celebration at the Garfield Park Conservatory (you can read about it here), which is an excellent place to visit during a cold and dreary winter. Much to Stella’s disappointment they didn’t have a celebration this year but she so enjoyed a project she learned there that she not only wanted to make it again, but decided to make a video to show others how to make it. This is a great project to do with your kids and I really love it because it uses materials that you probably already have. Stella used glitter to decorate her dragon but you could even use tissue paper or painted macaroni…get imaginative. P.S. This is the first time either of us have really attempted to do something like this and actually share it. It was very impromptu…in other words rough. I hope you can enjoy it, regardless!